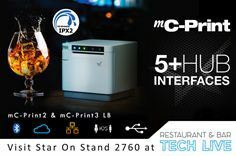 High Wycombe, UK, 20 September 2018 At Restaurant and Bar Tech Live 2018 (25 – 26 September 2018, ExCel, London), international POS printer manufacturer Star Micronics will be demonstrating on Stand 2760 how it leads the field in POS innovation for hospitality with its latest launch of the first POS printer with 5 traditional and unique interfaces with multiple peripheral hub functionality. Star will be joined by a number of software and payment partners including AccentPOS, Emperium POS, iZettle and TouchBistro. Ever mindful that hospitality venues are looking for sustainability, Star offers the unique mC-Print™ series with 80mm and 58mm print width models. This accompanies Star innovation in both traditional and tablet POS solutions with the first AirPrint POS printer as well as the first USB Lightning POS printer TSP143IIIU to provide direct communication and charging via the Apple-supplied lightning cable. For tablet POS with multiple USB peripheral control, Star’s new and unique TSP654II CloudPRNT-POS™ printer effectively responds to provide a versatile and cost-effective solution. Star’s latest product launch fully demonstrates how it understands the needs of effective hardware in a challenging multichannel world. The mC-Print printers offer not only the unique functionality of 5 interfaces and multiple peripheral support but connectivity for the restaurateur’s transitional journey from traditional EPOS to Cloud-based POS. They provide today’s traditional interfaces, USB and Ethernet, as well as tomorrow’s Cloud connectivity in order to meet the needs of a multichannel environment. Essentially, Star offers the ability to communicate with tablets using traditional WiFi and Bluetooth and a new and more effective direct cable communication with iOS tablets via the Apple-supplied lightning cable – a unique feature to Star. Star’s mC-Print2™ and mC-Print3™ seamlessly combine sophistication with high functionality, and aesthetically match the sleek, modern design of tomorrow’s hospitality environment to provide feature-rich, front-feed compact printers. With a print speed up to 250mm/second, the printers can feature all of the following interfaces in one model: Ethernet LAN; Bluetooth (MFi); traditional USB; lightning USB (data and charge USB for iOS) and CloudPRNT™ as well as Hub functionality for more than one peripheral; scanner, customer display, etc. Sustainability is key. Star fully understands this and has ensured the 58mm model is as intelligent as the 80mm model. Faced with the challenge of rising paper costs, Star’s thin paper support and choice of print width with ECO tools help users to economise on paper usage and reduce environmental impact. Star’s aesthetic design is not only stylish but also offers high functionality for a variety of environments. In particular, the soft operating switches, ‘protected’ control boards and IPX2 rating allow these printers to operate efficiently in demanding hospitality environments. And, with easy Ethernet setup / static IP address setup using the Star Utility (Native) via USB, installation costs are kept to a minimum. Incorporating Star’s Cloud Services with digital receipting and Internet device management mC-Print offers operators the next generation of POS printer that boasts a wealth of onboard marketing and receipt tools for tomorrow’s multichannel world. Demonstrating Star’s focus on connectivity, operators can today purchase a Star TSP654II with a traditional interface in the knowledge that it is future-proofed for whatever Cloud strategy the operator wants to adopt and provides an easy, affordable upgrade by simply replacing the traditional interface with the HI X interface. The interface can also be used with other Star printer models that offer 80/112mm label, ticket and receipt printing – TSP743II and TSP847II as well as SP700 matrix printer. Alternatively, the TSP654II HI X with CloudPRNT is ready for the Cloud as the interface is built in. Both solutions offer intelligent printing for modern Cloud applications and, in particular, online ordering. Star’s unique TSP654II CloudPRNT-POS™ solution allows operators to benefit from tablet POS with complete USB peripheral control from a web-based application on any device with a browser. While tablet POS offers the advantages of versatile Cloud-based software alongside compact, low cost hardware it has one disadvantage which is no connected peripheral control. Recognising this, Star has developed a solution that allows Cloud-based software to run on any tablet or smartphone (Windows, Android, Linux or iOS) with peripherals controlled through the printer to provide a complete POS transactional solution with all the advantages of tablet POS. The solution can be used as a hub providing IP connectivity via wired Ethernet or WiFi with peripheral support, by means of 2 USB host ports with full status back. Star’s SCD222 customer display, 1D / 2D (Symbol) barcode scanners and cash drawers are the preferred peripherals and can be purchased via Star’s distributors. Connecting the Star printer and device to the same network creates a complete and connected tablet POS application that is easily accessible across any Internet enabled device.